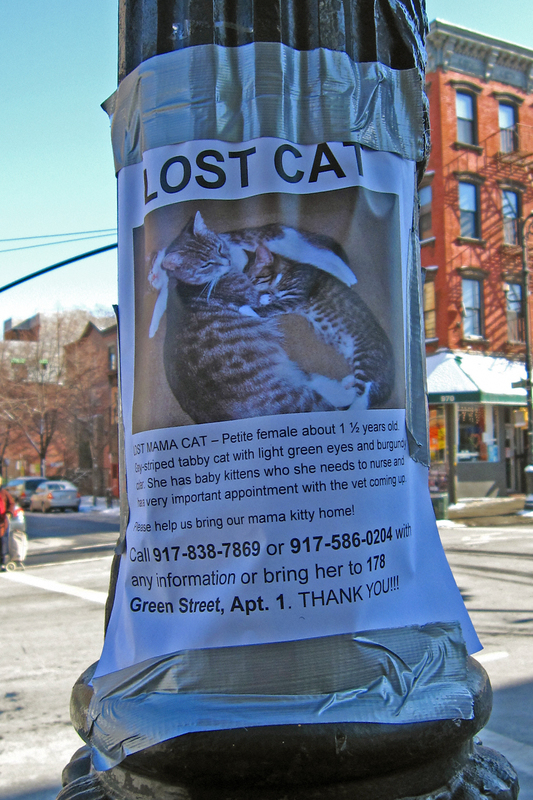 Green Street Mama Cat Is MIA! Fliers like this break my heart. Unlike a lot of people who can no longer afford their pets and simply toss them out on the street or dump them at the nearest feral cat colony the person who lost this cat simply didn’t know any better. A popular misconception (which leads to the conception of a lot of kittens) is that nursing cats cannot go into heat. They can and will. And when female cats go into heat they make every effort to escape. That’s what happened here. If you have seen this lovely momma cat or know of her whereabouts please contact her person at either of the above telephone numbers. Not only is this man heartbroken, he wants to get her spayed before she has any more kittens.